When it comes to dressing to impress for your big day, the biggest trend is to go nontraditional. From colored gemstones to statement-making earcuffs, this bridal season is all about putting a modern spin on your wedding favorites. Continue reading the Trendspotter to get all of the details! If you’re already sold on the nontraditional trend going on in the bridal world, you are in luck. There are plenty of options out there for unique engagement rings. From colorful gemstones and vintage-inspired designs to mixed metal settings, stepping out of the (ring) box never felt so stylish. The traditional veil has taken a back seat lately to make room for a more modernized look, which include headbands and hair accessories. Adding a sparkling hair piece to your bridal updo or a headband to your flowing locks will definitely add a special touch to your big day. 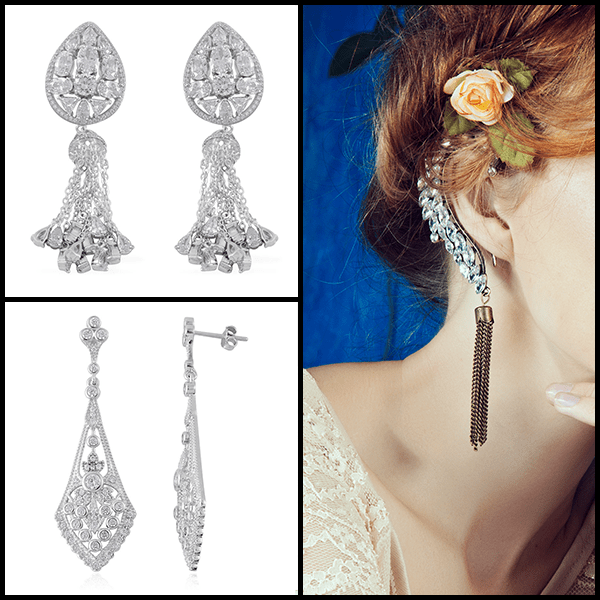 If there’s one occasion when earwear really comes into its own, it’s definitely for a wedding! Earrings present a fantastic opportunity to bring more attention to your gorgeous face on your special day. Nothing yells louder (in a stylish way) than a pair of statement earrings. Longer lengths, new locations and asymmetry are all great features for a pair of bold earrings. Earcuffs have really become a hot trend in the bauble world. Find a pair with a delicate design to really add glamour to your look and to frame your face. The nontraditional bridal trend calls for unique, modernized designs. Don’t be afraid to mix metals, include colorful gemstones or add anything fresh on your big day. For more tips and tricks for this look, be sure to check out our Trendspotter segment on YouTube! Which part of this trend do you like the most?